Even at the height of IPL fever, we look to Cricket news elsewhere ~ and there is lot happening downunder ! ~ i.e., cricketing news from Australia New Zealand as we see them on the bottom part of any map. Australia's Test and ODI captain Tim Paine says there was a point in his career when struggled so badly to come to terms with his rotten run of injuries that the mere sight of his Baggy Green cap "pissed me off". Paine, who was appointed Test captain amid the fallout from the Cape Town ball-tampering scandal, only returned to the Test side last summer after a hiatus of more than seven years – a period in which he was plagued by endless finger problems and ultimately a severe loss of form with the bat. 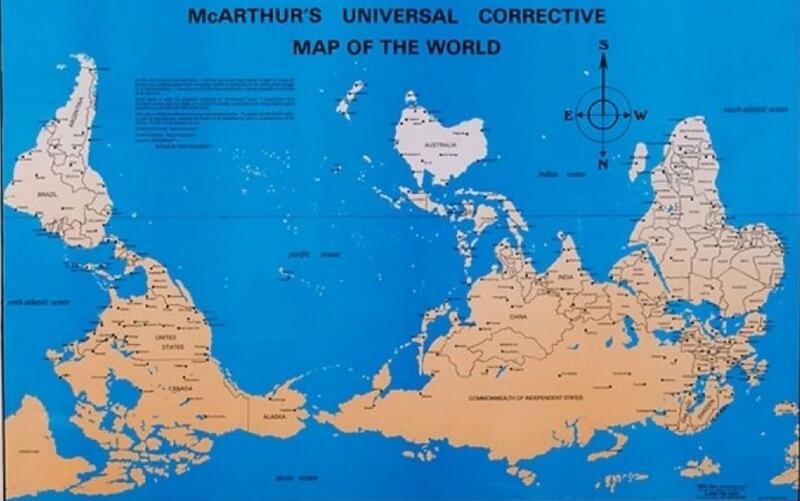 When a similar map was shown to a group of Executives – almost all of them instantly remarked ‘wrong map’; ‘computer error’; ‘display error’; ‘upside down’. .. .. for we have all along been used to seeing maps with North up. For those who don’t just take it for granted, the common answer is that Europeans made the maps and they wanted to be on top! There can always be other ways of looking at the globe Putting Australia at the top half of a map, as was done in McArthur's Universal Corrective Map (1979), may seem like the work of some prankster in the Outback, but in fact, there is no intrinsic reason to put the Southern Hemisphere at the bottom. Nor is there a universal mandate that requires the "Prime Meridian" to pass through Greenwich, England. Instead, these are choices based on mapmakers' objectives and biases. Like other choices in mapping, they show how individuals in a particular time and place perceived their world. Today there is interesting doodle on a man who began his life as a map-engraver, in 1547, entered the Antwerp Guild of Saint Luke as an illuminator of maps. He supplemented his income trading in books, prints, and maps, and his journeys included yearly visits to the Frankfurt book and print fair where he met Gerardus Mercator in 1554. In 1560, however, when travelling with Mercator to Trier, Lorraine, and Poitiers, he was attracted, largely by Mercator’s influence, towards the career of a scientific geographer. Today Google Doodle is celebrating Abraham Ortelius, the legendary cartographer who published the very first modern atlas. 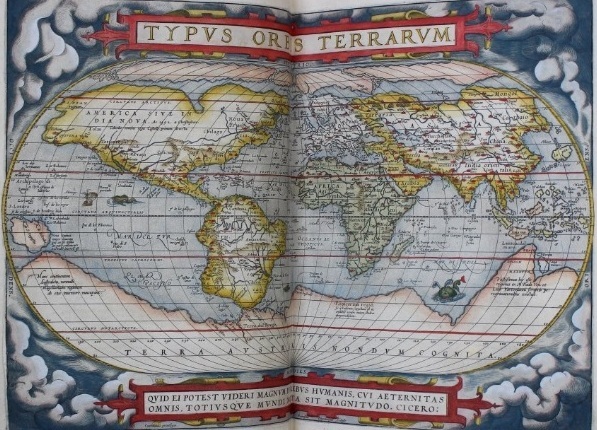 Theatrum Orbis Terrarum (Theatre of the World) is considered to be the first true modern atlas. Written by Abraham Ortelius, originally printed on May 20, 1570, in Antwerp, it consisted of a collection of uniform map sheets and sustaining text bound to form a book for which copper printing plates were specifically engraved. Abraham Ortelius was born in Antwerp, modern-day Belgium, in 1527, and was raised by his uncle following his father's death. Ortelius travelled widely across Europe, including with the renowned cartographer Gerardus Mercator, who is thought to have first inspired his passion for map-making. After publishing his first map in 1564, he went on to become one of his era's foremost cartographers, acknowledged as one of the founders of the celebrated Netherlands school of cartography. On May 20, 1570, Ortelius published the Theatrum Orbis Terrarum – Theatre of the World – the first modern atlas. Coming a year after Mercator released his legendary world map, it consisted of 53 decorative maps, occasionally adorned with sea monsters, a fascination of the time. Earlier, in 1564 he published his first map, Typus Orbis Terrarum, an eight-leaved wall map of the world, on which he identified the Regio Patalis with Locach as a northward extension of the Terra Australis, reaching as far as New Guinea. This map subsequently appeared in reduced form in the Terrarum (the only extant copy is in now at Basel University Library. The man celebrated today - Abraham Ortelius (1527 –1598) was a Flemish cartographer and geographer, conventionally recognized as the creator of the first modern atlas, the Theatrum Orbis Terrarum. The publication of his atlas in 1570 is often considered as the official beginning of the Golden Age of Netherlandish cartography. He is also believed to be the first person to imagine that the continents were joined together before drifting to their present positions. The Flemish or Flemings are a Germanic ethnic group native to Flanders, in modern Belgium, who speak Dutch, especially any of its dialects spoken in historical Flanders, known collectively as Flemish Dutch.